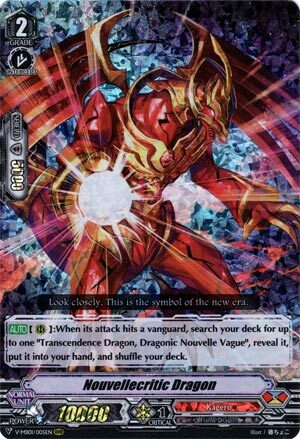 [AUTO](RC):When its attack hits a vanguard, search your deck for up to one “Transcendence Dragon, Dragonic Nouvelle Vague”, reveal it, put it into your hand, and shuffle your deck. Rather annoyingly, we don’t get any new cards until December the 14th, and that’s when we do the Top 10, usually. So prepare thyselves for weeks as slow as molasses before we can actually get to anything remotely decent. This, as you guessed, is not remotely decent. Sure it’s a free +1 if it hits, so it’s incentive for the opponent to block, but with no extra power to carry it home, being unusable as a vanguard and few ways to cary power above 20k shield to block, this really only exists to give Vague some consistency, but if you want to plus, I’d rather take the plusses from getting to guard less by blowing something up.